Carolina Panthers Score More Points Off Field! We sat in our house last night, along with the rest of the country watching the NFC Championship game. We had a special interest in it since the team from here in Arizona, the Cardinals, were playing in the game. But we also had another reason to watch... our brother and his family would be at the game. They live in North Carolina. He works for the team. His daughter got those prime seats as one of her birthday gifts last week! 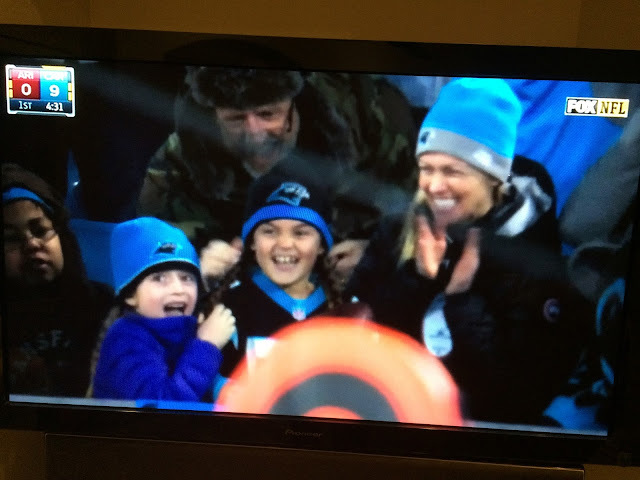 But imagine our surprise when we saw our 2 nieces (and their mother) end up on television! They were given the ball by a Panther after he scored the first touchdown of the game. 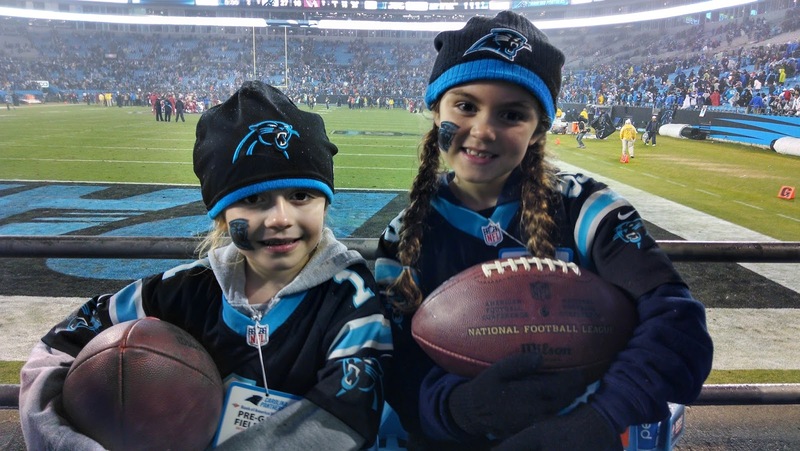 Some other young fans were also gifted special touchdown balls throughout the game. Clearly there were enough to go around! By now you're aware the Cardinals lost that game. 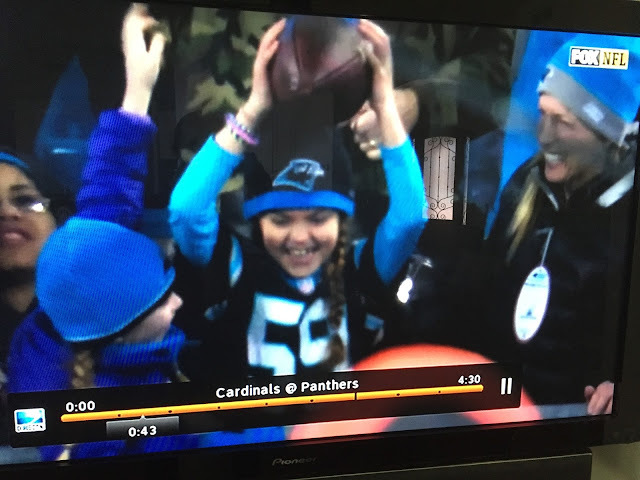 The excitement was not surprising... these 2 little girls have been big fans of the Panthers game for all of their young lives. But what was a little unexpected... all the attention these little girls are getting! After their national TV debut... I'm pretty sure the picture(s) have been tweeted and re-tweeted about 1 million times now! They also made another website just a smidge larger than mine. The Huffington Post. See that article HERE... and even USA Today see that HERE - they're both short but sweet little articles on the Panthers continuing down this path of giving their touchdown balls to young up and comers like them! The players do it at almost all of their home games. I'll tell you - as a fan of the game - but not of some player behavior - this small but momentous gesture is incredibly re-freshing! So, sure we Arizonans may be disappointed the Cards put barely any points on the scoreboard last night... but I'm also pretty sure the real points may have been scored off the field anyways. Good luck in the Super Bowl Panthers. I have a good feeling you already won! Never say: "I Wish I Would've..."
A life full of regret is your choice. A life full of chances is too! 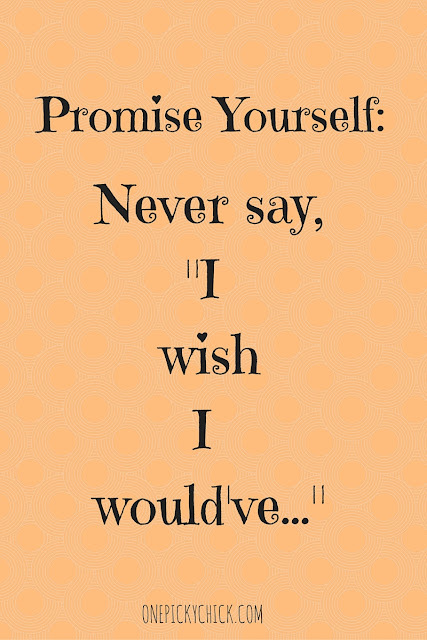 Here's how to never say, "I wish I would've..."
It's a lot of pressure. The start of a new year. There are things you need to do. Things you have to do. Things in which you are expected to do. But I ask, what do you WANT to do and what do you wish for? What is it that you will one day regret that didn't get done? Do that. This story begins many many years ago - when I was entering high school. I was a young child all of 14 years old and I wasn't quite sure what to think about becoming a first time Freshman. It didn't take long - for others to tell me. As they spoke of the yester-years, a few people would get this glassy look in their eyes as they talked about their former days of glory. I would say, however, that most of the people didn't react that way. Instead, most hesitated and remembered a chance gone by. A lost moment in time. 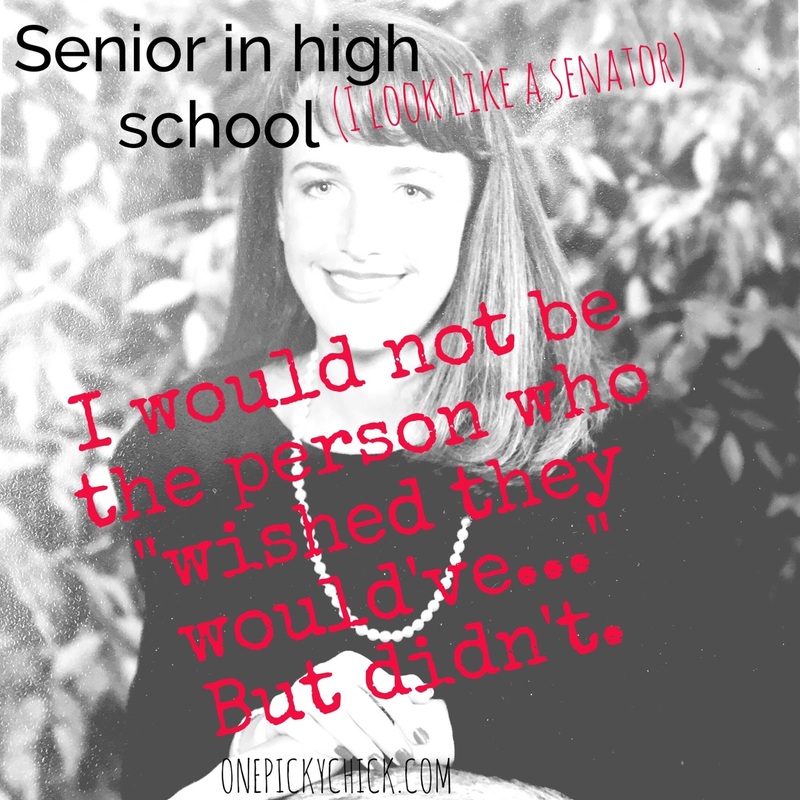 Over and over again I heard: when I was in High School I wish I would've... tried out for the school play, gone for school President, took up a sport. The possibilities of missed chances were endless really. But here's what happened after hearing it so often: the phrase ended up sticking with me. I decided, shortly after embarking upon the 4 years ahead that I would not be the person who wished they would've but didn't. 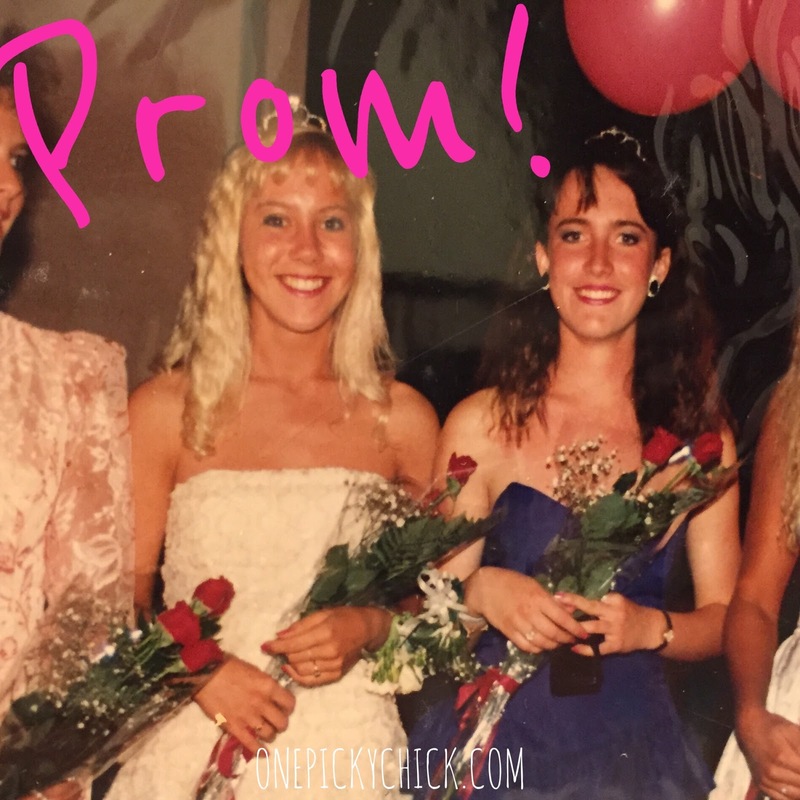 to planning the Prom - the list went on and on. Yes, even the French Club. And the talent show. I mean, really, everything. At the end of my time in high school, sure I had great transcripts (yes, I did school work too) but more importantly I felt super fulfilled. I would never look back and think man, I wish I would've... because I did. This thinking continued in college. I once again, did it all. Cheerleading, internships, on-campus office manager, acting... a little less than high school because classes became more of a priority. But by the time I left that higher learning institution I too felt like I used my time as best as I could while I was there. 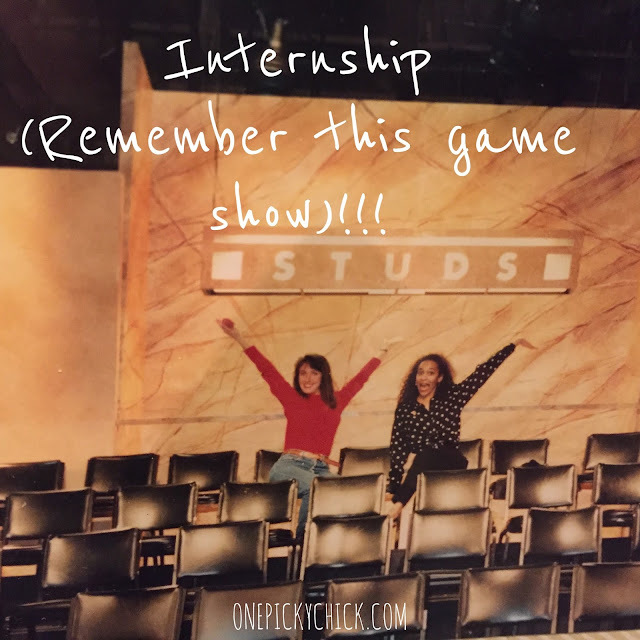 It was at this point, on the brink of starting on a career in journalism that I realized my small life lesson was gaining serious and valuable ground without me even noticing. That the phrase I used to define my high school career began to define my entire life. Now don't get me wrong, just because you wish it to come true... doesn't mean it will. You have to put in the hard work, time, mix it with some determination and shake it with a dose of luck but if you try and maybe fall short or even fail then you still no longer wish you would've... because you did. Not to mention, that "failure" probably took you down a road you never dreamed you'd be on. Maybe even a better one. This rationale still drives me today. At one point in my career, I wanted to be a Katie Couric or a Diane Sawyer on the national Morning News. But as I continued in TV News, I made a conscious decision not to do that. I came to realize my own story was more important to me than the ones I was telling. If I wouldn't have quit journalism, sooner than later, I'm positive I would have thought: I wish I would've been a stay at home Mom. 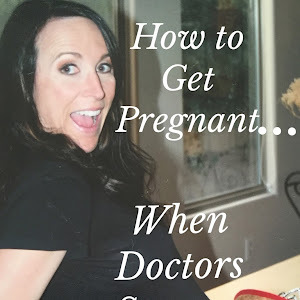 I talked about it a long time ago, for the first time, in a blog post called Super Sick Mom and then again last year in one called 5 Reasons to Stay-at-Home when Kids are Older vs. when they're Babies. In fact, my school of thought is part of the reason I now do almost everything. 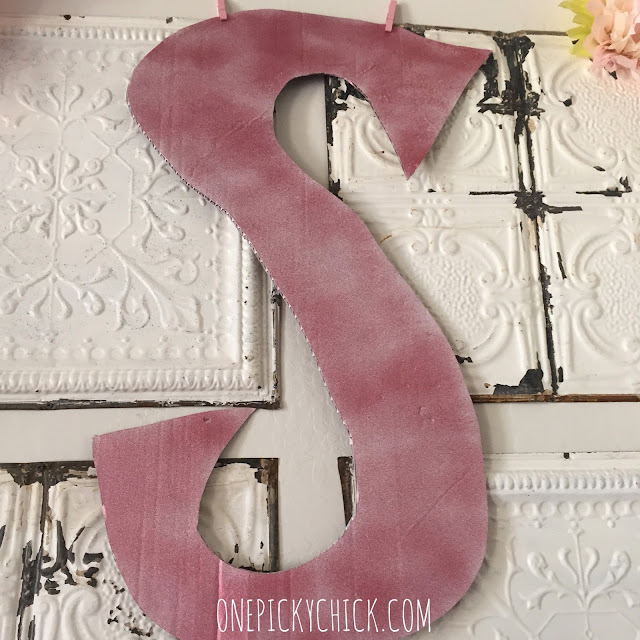 It's why I take the time to do what I love, like decorating... read 5 Easy Projects to Make a House a Home HERE and Do-it-Yourself Projects like my Dream Closet or all the remodeling we've done: our White Bathroom or see the Before & After photos of our White Kitchen. 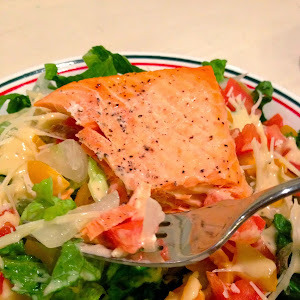 It's also why I learned to cook (a little)... see this Sweet/Salty Salmon Dish HERE. I even bake, occasionally, these Caramel Brownies melt in your mouth (& took 5 minutes to do)! 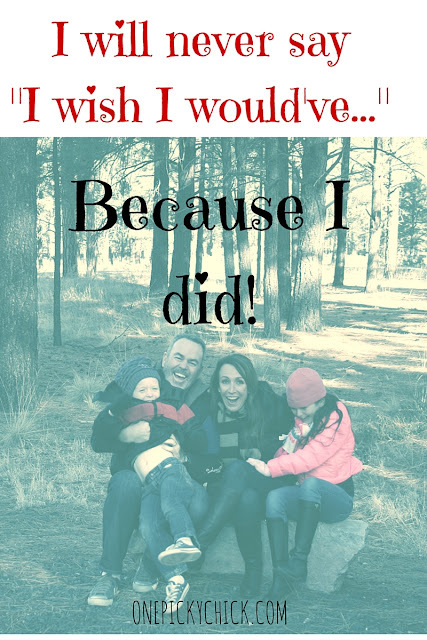 I wish I would've helped me find the Right One... rather than letting him slip by for the "right now" one... it made me work harder than ever to have my second child during my Fight For Fertility and then reminds me to not take them for granted when they're driving me nuts because Mother's Day is everyday - even though we forget that sometimes. I wish I would've makes me want to put on special parties like this Police Birthday Party for my son or a WINE TASTING for my friends! 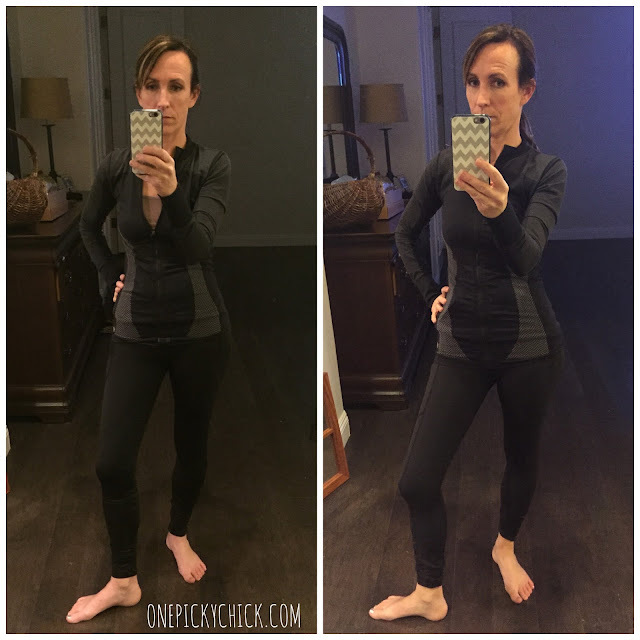 It helps me stay in shape with these 5 Simple Weight Loss Tips and keep myself up even when the HONEYMOON is over! It also drives me work hard to be the Best Mom possible even if it makes me the Meanest Mom in the Room! The school of thought taught me to say things that others leave un-said. To let people know how important they are to me. I wrote about it HERE, in a frightening case of fore-shadowing, just before my Dad had a very close call with a brain aneurysm. Finally, it's why I started this blog. I wanted to put things down in one place. Maybe only 10 people are reading it but I know it's there... and one day my kids will too. In the end, I guess what I'm saying boils down to this simple example: if you love the game of football you don't have to become a professional football player. But you do owe it to yourself to try out for the team. If you don't make it you must watch the game, read about the game and maybe one day coach the game. Or just work at the stadium in which the game is played. It's then and only then, you'll never say I wish I would've... because you did. 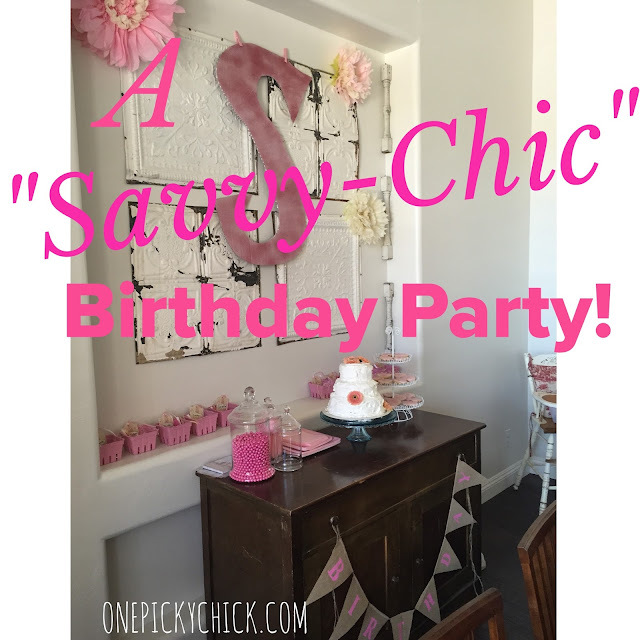 We gave her a "Savvy" Chic Party! I get it. Birthday parties are a lot of work. Many parents pay a place outside of the home to do the job and be done with it. There's definitely something to be said for that... but I just can't. I will, someday. But I haven't yet. I enjoy doing the work. Because it's part of being a parent. And the hope is, your child will remember it for a lifetime. 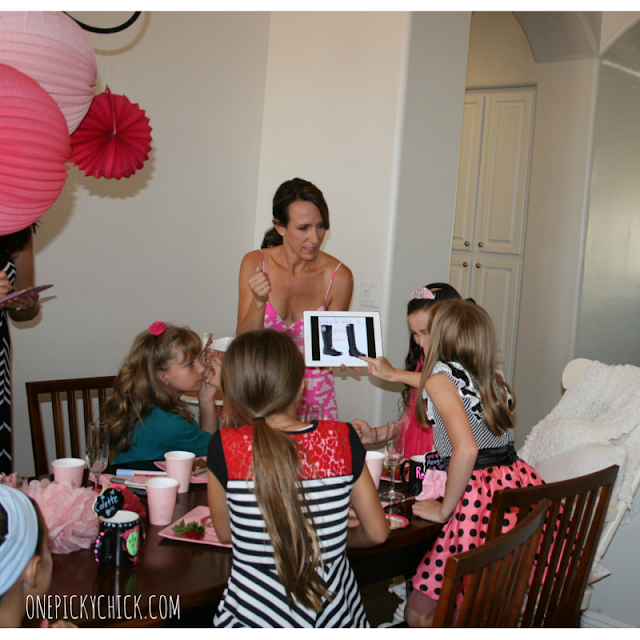 That's what I hoped when I planned this party. 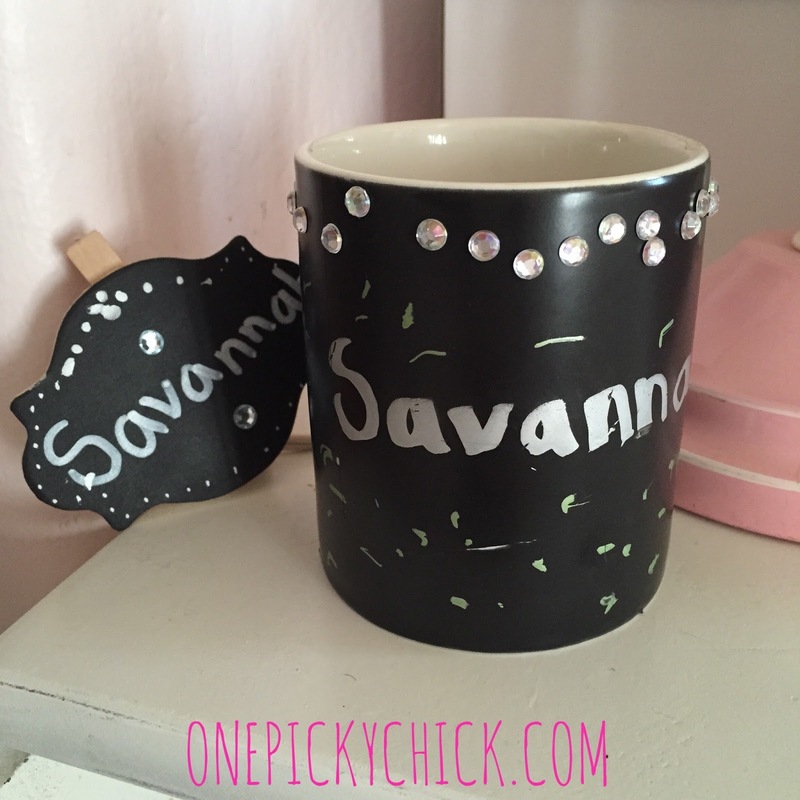 See, my daughter's name is Savannah, we call her "Savy" for short and she actually came up with the idea! I liked it because it opened a whole realm of possibilities. We could do whatever we wanted! Which is exactly what we did. As always, you start with the invite. I usually make mine. Remember, it sets the tone. 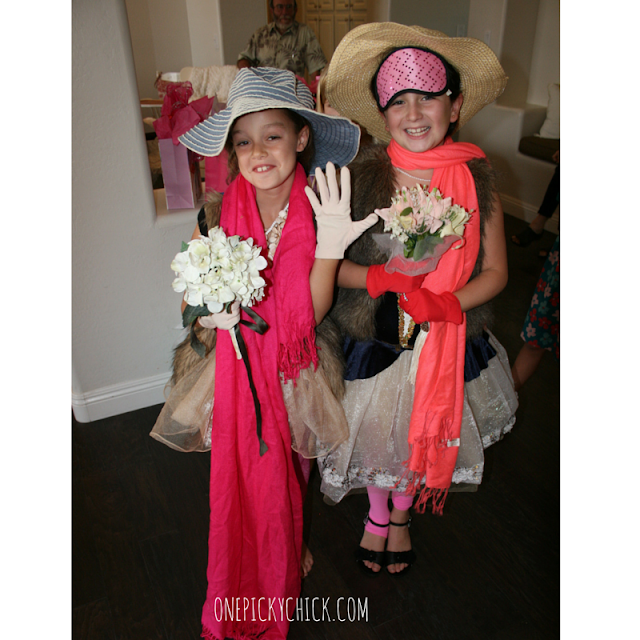 Ours said "Hello Friends, take a peek, welcome to our Savy-Chic" (***spelled wrong intentionally because that's her nick-name)... then when you opened it up it said "wear your fanciest dress and prepare to be (sparkling) wined and dined!" Now, decor. I wanted it to look really pretty and "shabby chic-ish" so I cut this big "S" out of a big piece of cardboard I got for FREE at Home Depot (it was just an old box they didn't need). We first spayed it white and then sprayed with a sparkly pink color. We hung it on the wall along with some other paper flowers and balls (bought from Michaels) added to the chandelier. It looked awesome! Setting the table was easy. Obviously, the designated color was pink. 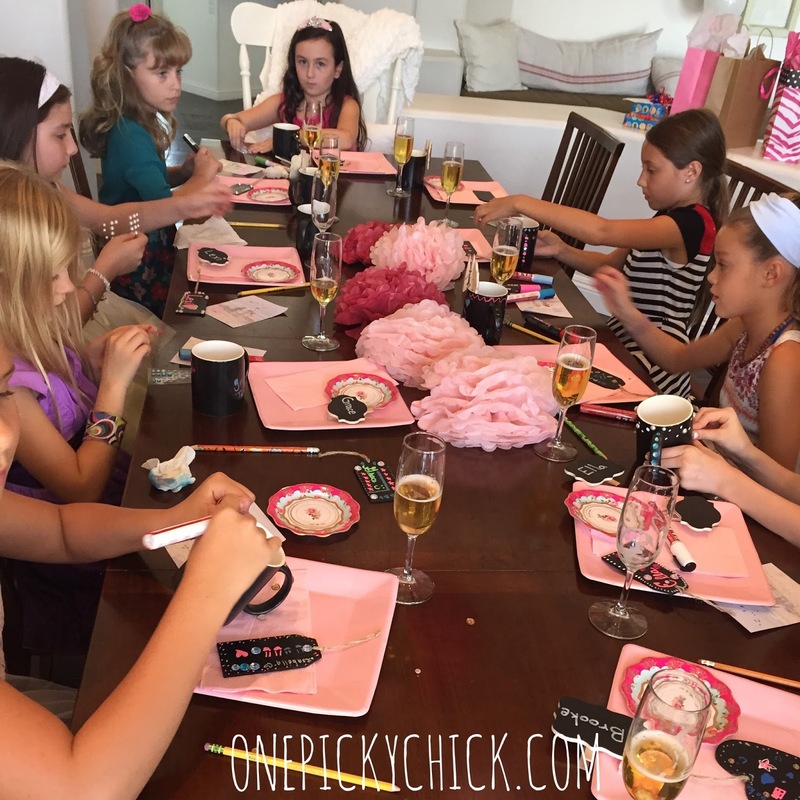 Also, the table decor was actually part of their crafting too. More on that later. 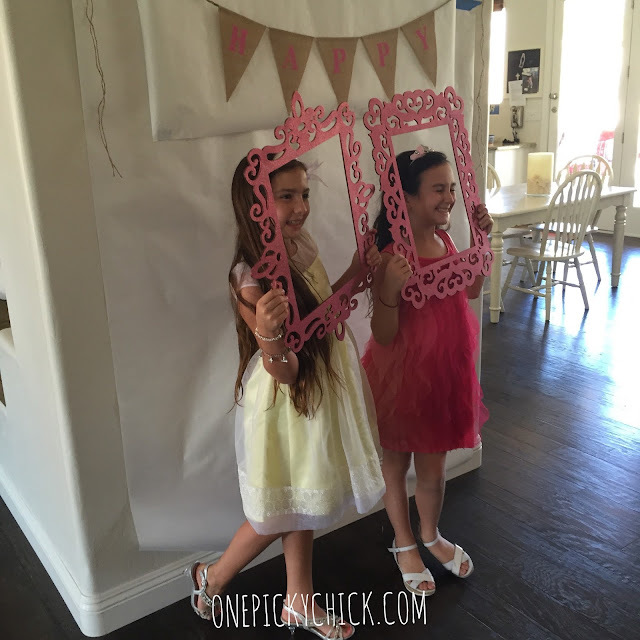 Here's the party play by play: when each girl arrived they got to shoot some pictures with the birthday girl at the "photo wall"
These frames came from Michael's and were spray painted with the same glitter paint I used on the above "S" but without the white paint behind it so it took on a little different look. 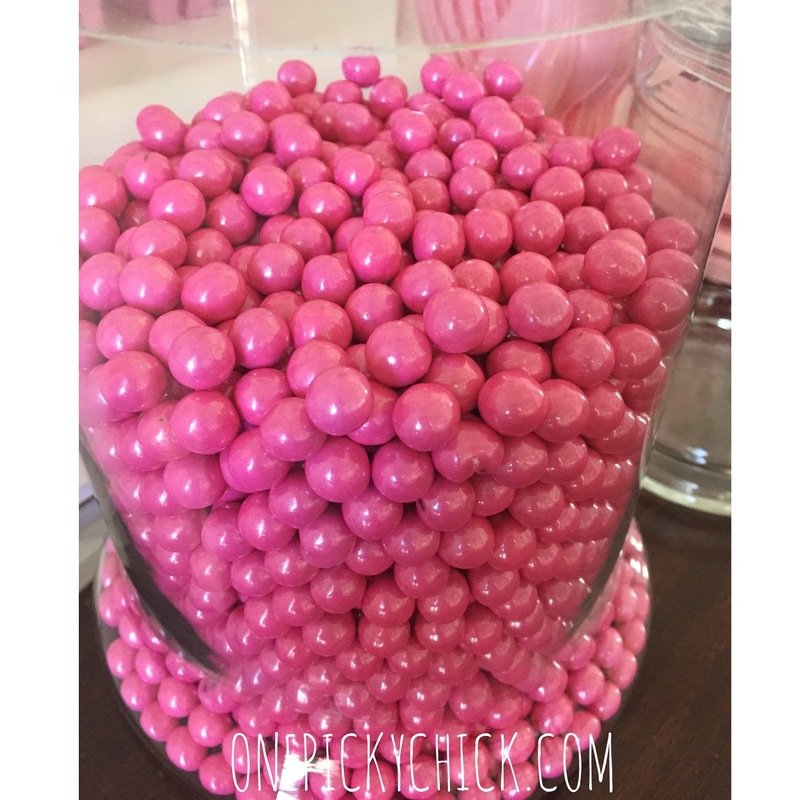 It was at this time they also guessed how many candies were piled up in this glass jar, the closest one, won a prize later. **For the record, this is a game I do at almost every party for 3 reasons: 1, the candy always adds to the decor, 2 it's an easy game, 3 the candies can double as a take away when kids leave! BAM! Once all the girls arrived and everyone settled in we started on the crafts. 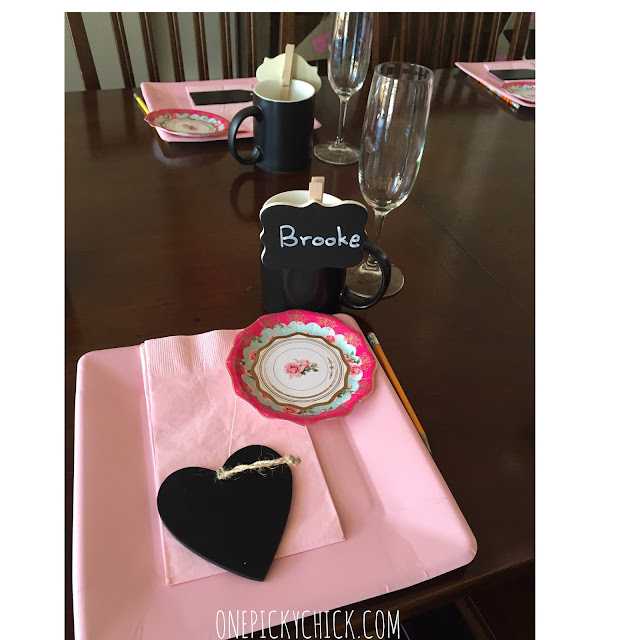 We purchased chalk pens and stick on jewels so they could decorate chalk tags (to be used for ornaments come Christmas time), mugs and they could add anything to their name tags that had been placed at their seats. They loved it and this took at least 30-40 minutes. During this time they also ate. The food was super easy because I treated it like a tea party but with sparkling cider to up the cosmo factor a bit! 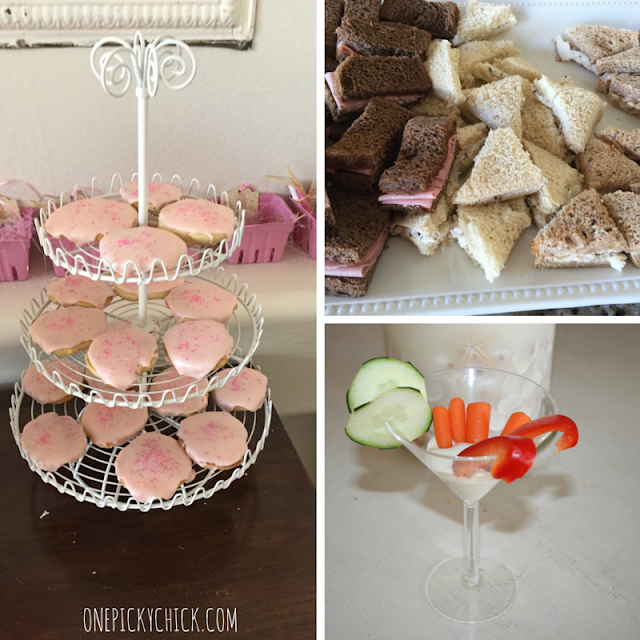 After the cider was served we had finger sandwiches, veggies dipped in ranch but placed in a martini glass - of course - and cookies/candies! 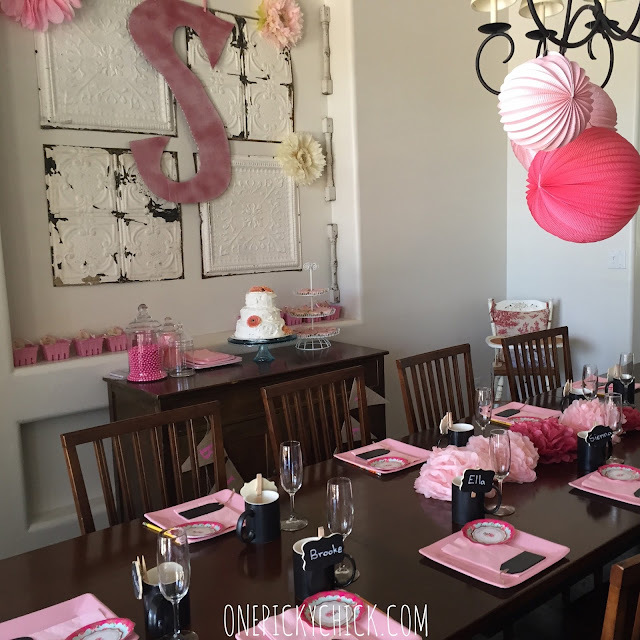 All courses were served to them as they sat around the table and did the crafts. Then it was time for the memory game. 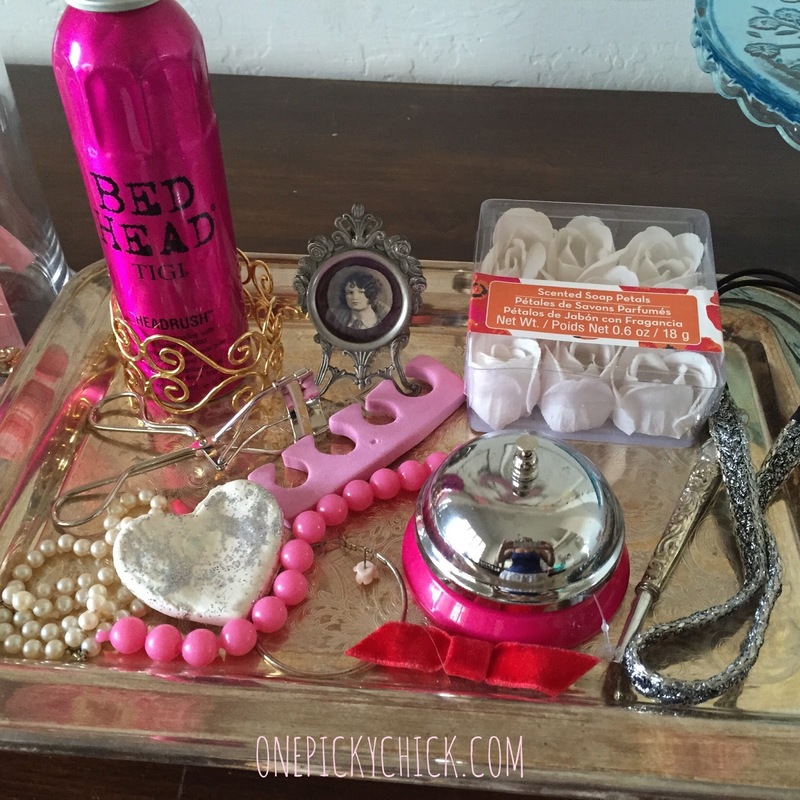 Each girl got 20 seconds to look at this tray of girly, "Savy Chic" items. Then, once it was taken away, they wrote down as many of them as they could remember. The winner got a prize! They loved it. (see 4 pictures below). 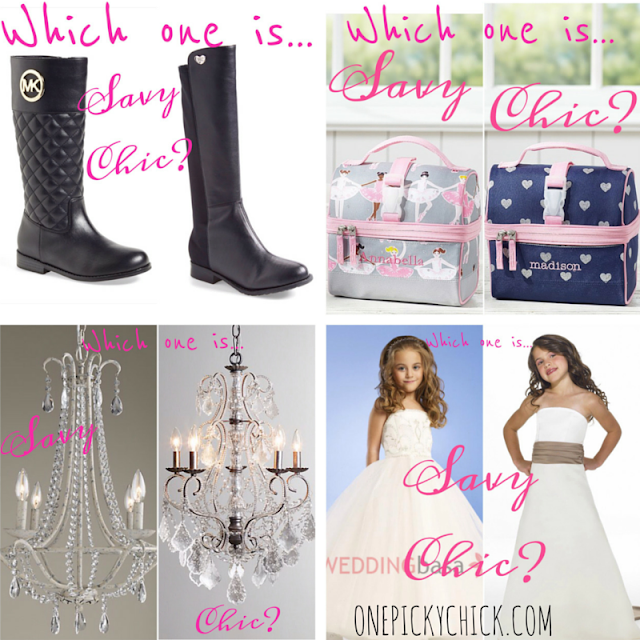 They then had to decide which one was more "Savy-Chic" - in other words - which one did my daughter liked more!? The birthday girl looooooved this game because it really helped maintain the focus on her (what every birthday girl wants)! 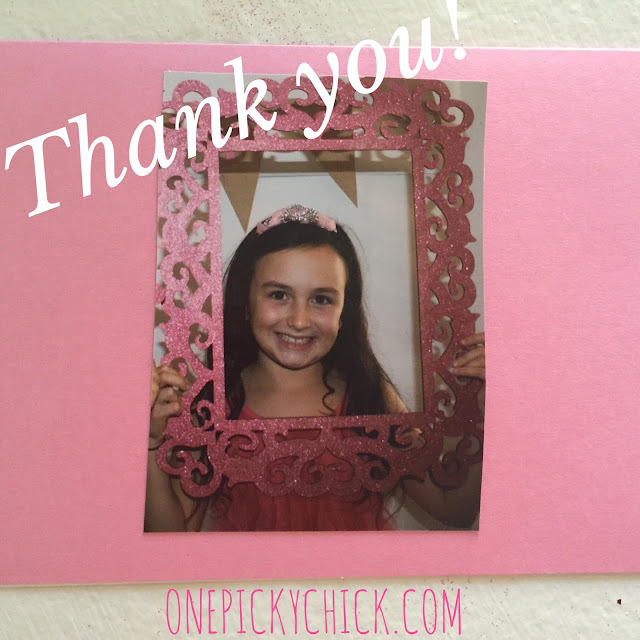 The girl who got the most right - won a prize! Which did she choose? All the pictures on the right, accept for the chandelier, she liked the one on the left! Finally, it was time to get up! They were ready at this point. They'd been sitting, eating and creating for over an hour. We split the party into 2 teams (there were 12 girls total) each team had to dress up 1 designated girl with a bunch of fancy clothes. The team who did it the fastest, won! Prizes of course... I was surprised how much they liked that game too. Sidenote, we've done different versions of this game at class parties (winter wear for Winter party or toilet paper for a Fall party) and it always seems to turn out really great! there are donut holes inside! Yep. You just stick those suckers inside your batter and bake away! 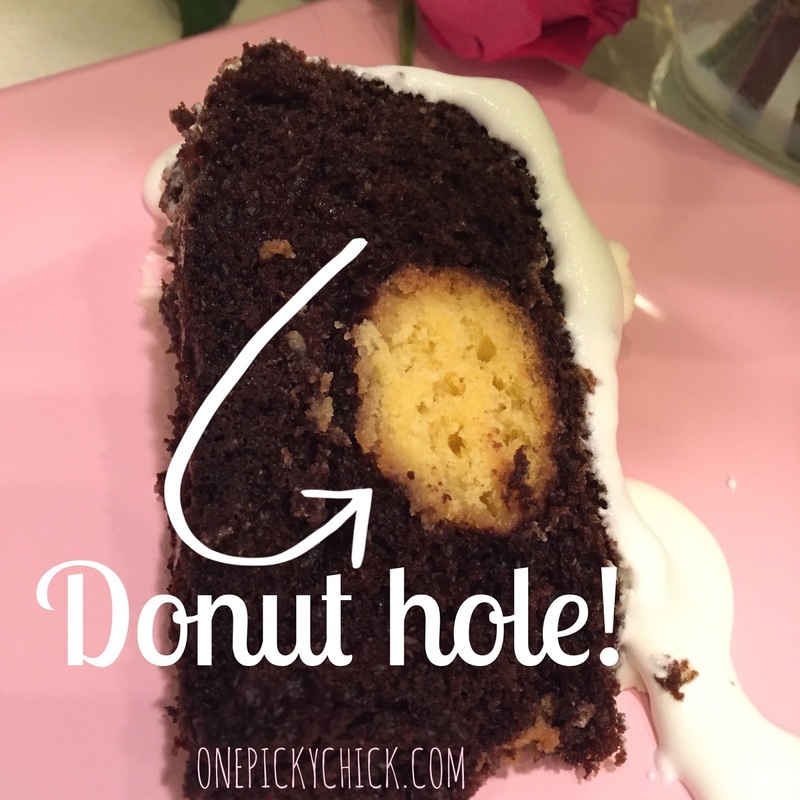 It makes the inside polka dotted when you cut into it. STUNNING! 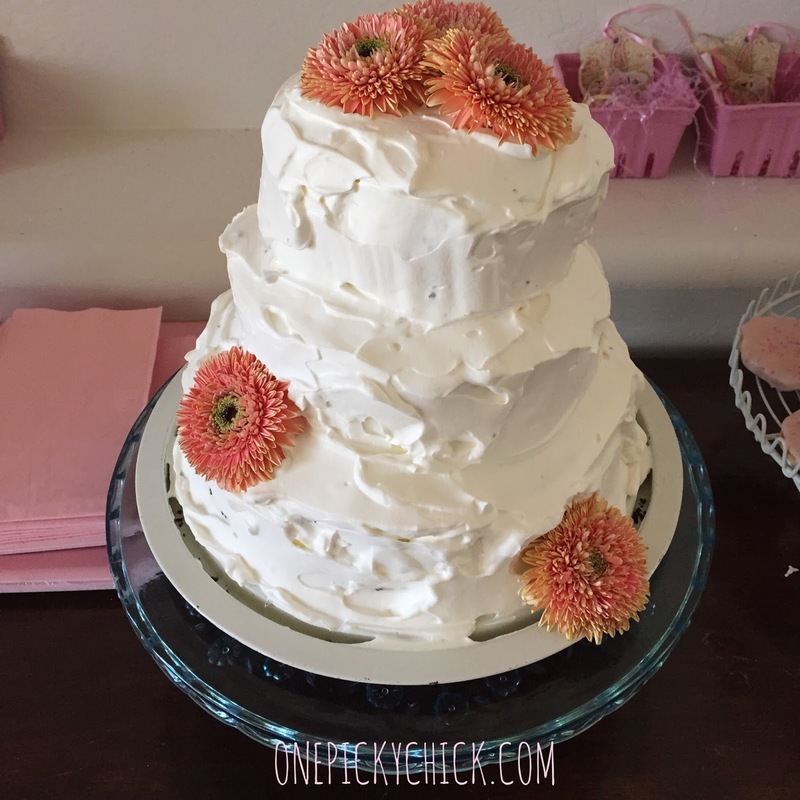 I did 3 layers of cake and just cut each size a little smaller so it would rise gradually like above. Hard to do? Naahhhhhh.... but make your own whipped frosting to up the ante a bit. Pin this baby now! Mix with hand mixer... until stiff peaks form. Stop and frost! I put on almost all my cakes because it's so light and refreshing. 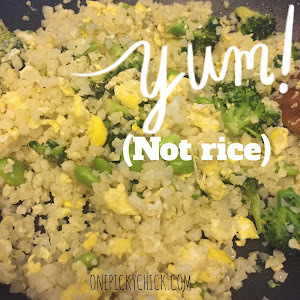 Major yum! That's it... party over. Their take aways were everything they made, plus these cute little cartons filled with some nail polish, real chalk and that pink candy we talked about earlier. 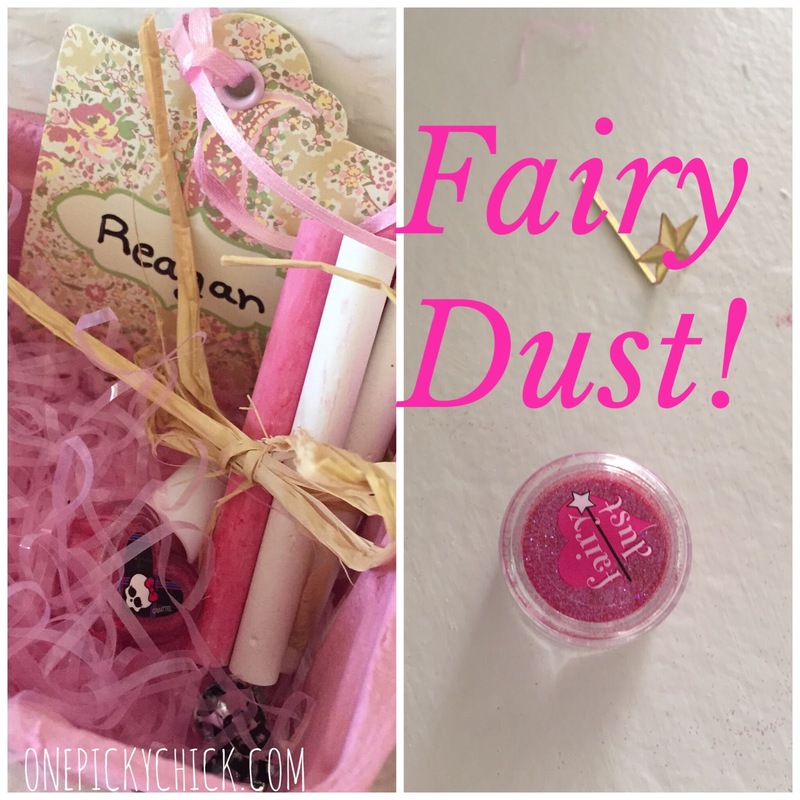 And a little dab of "fairy dust" on their way out the door. It's all about the DETAILS people! The final little touch, as always, the thank you notes. We used the pictures that were taken with the girls when they first arrived. Each card had one picture of the the birthday girl and friend stuck to the front of the card and another tucked inside. It was really cute. In the end, worth every second. Make that every hour. A lot went into it. 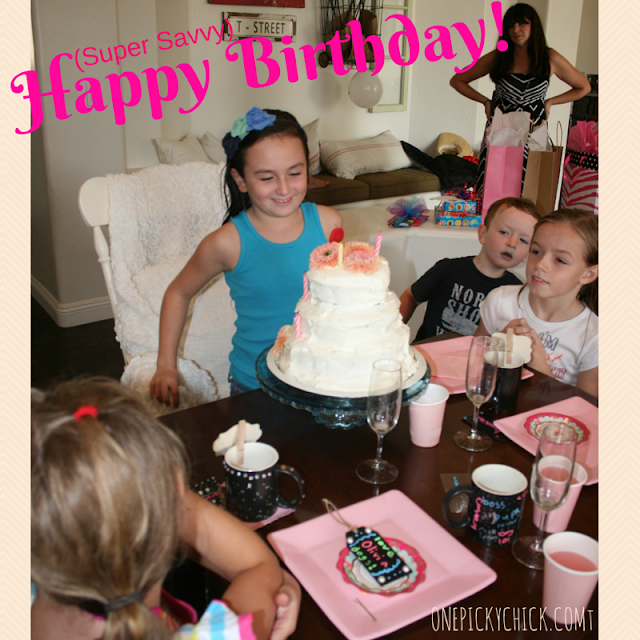 Because after it was all over I asked my little lady if she had a good time and she simply and definitively replied, "Mom it was the best party of my life..."
That, my friends, was all I needed to hear. 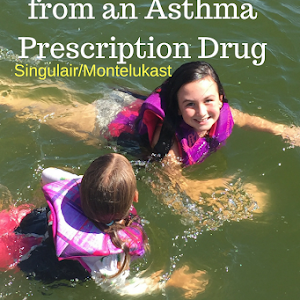 After the year we had just come off... (read our warning of prescribed drugs and children HERE) those words were golden. Now, do I have to top it next year? 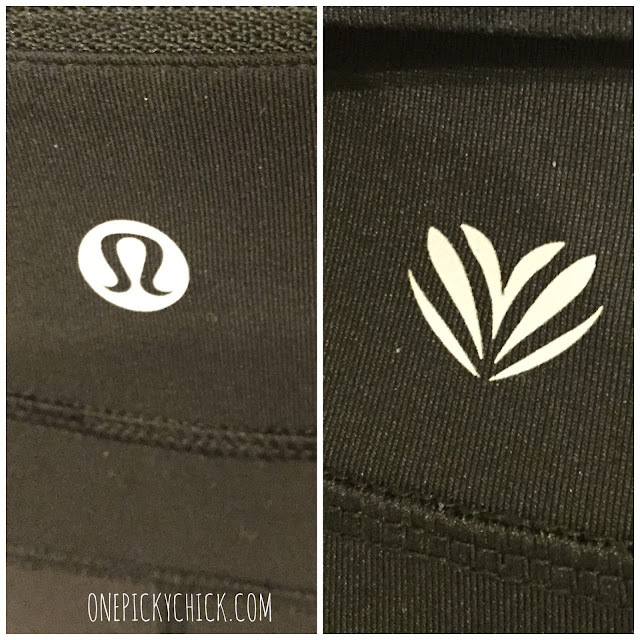 I got Lululemon for Christmas. Christmas is a special time. For many many reasons: Jesus, family, peace, vacation. But let's be honest - gifts - are on that list too! People love getting things they covet. Alas, inevitably, during the exchange of all that stuff - many get something they really want but don't really need. The husband (BP) and children went on a shopping trip to find me something special. Sweet, I know. They got me Lululemon. Know what that is? Let me break it down for you: it's fricken expensive sweat gear. Or a more politically correct way of saying it is probably: stylish active wear. I have never invested in any of the pieces because it truly is an investment. The stuff is pricey. Yet, I like many stay at home moms these days, tend to live in that type of "Active Wear" for many reasons: they're cute, fit nicely and boy are they comfy. So my family decided it was time I tried the clothing women across America have fallen in love with and paid the (high) price to buy. Are these pieces really, really worth it? 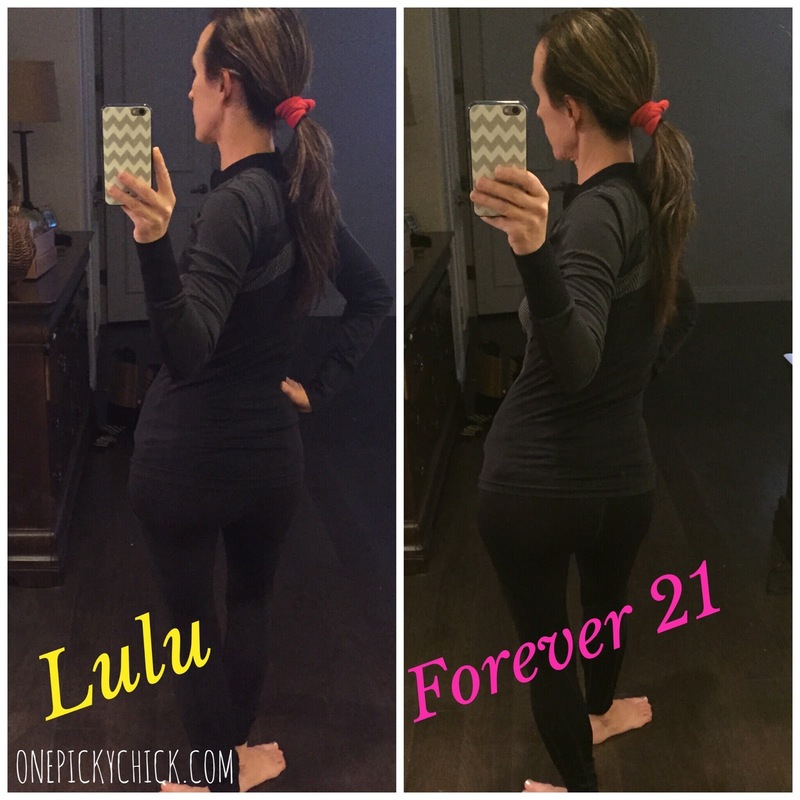 I've shopped Forever at at Forever 21... long before I was 21. And I still get their clothes (carefully)! 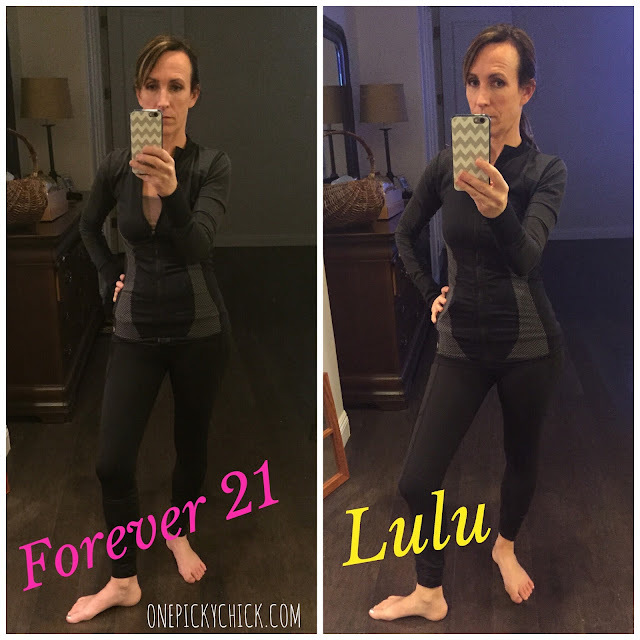 A couple years ago, with the onset of the popularity that is Lulu, I noticed they started coming out with some really great (well priced) "Active Wear" that's A LOT cheaper than Lulu. Put it this way... 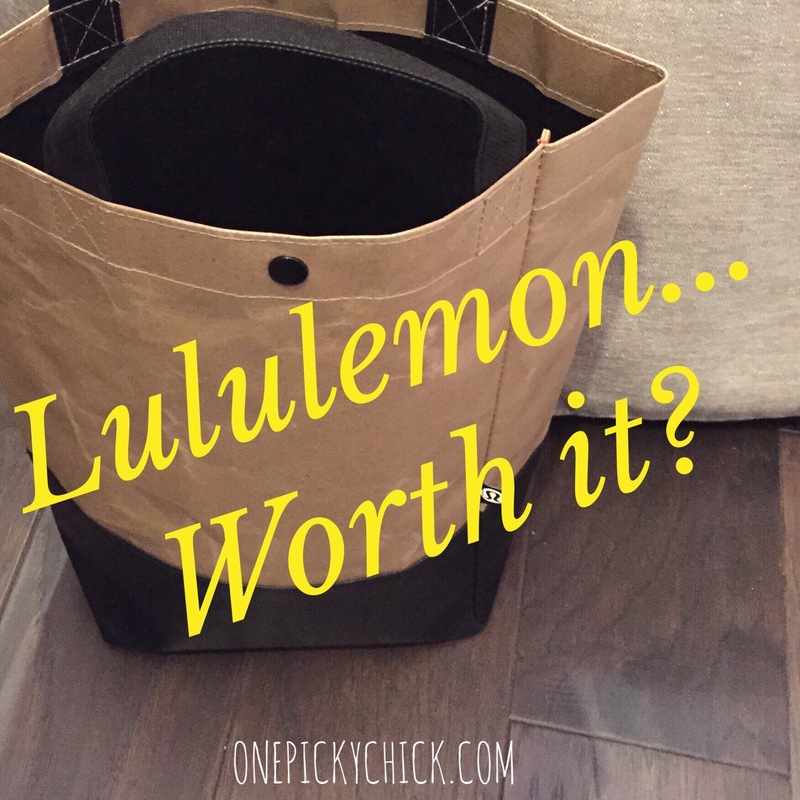 I can get almost 5 pairs of their pants to one Lululemon! 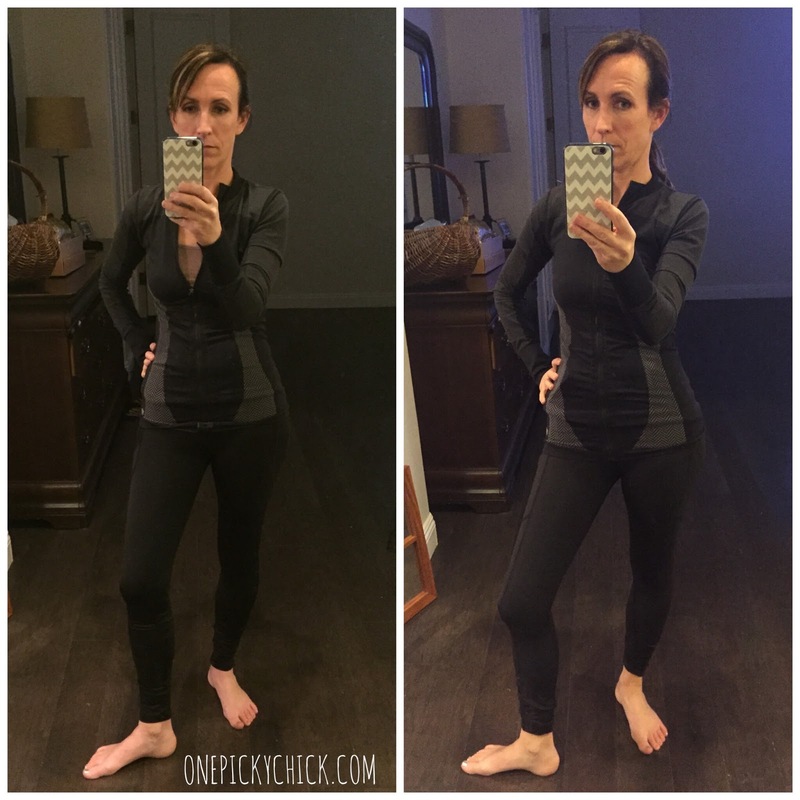 This year, it just so happened I had bought a pair of black "Active" pants right before Christmas. So when my family got me the name brand stuff I decided to try them both on and see which one fit better. Can you tell which is which? Can you tell which one cost $110 and which one was a mere $20? Seriously can you? Or maybe I should ask which one looks better? Any thoughts? Tell me in the comment section below and let me reveal it now. Be honest. Not too different? If I had to pick one - it might actually be the Forever 21 pair - according to these very UN-scientfic pictures! 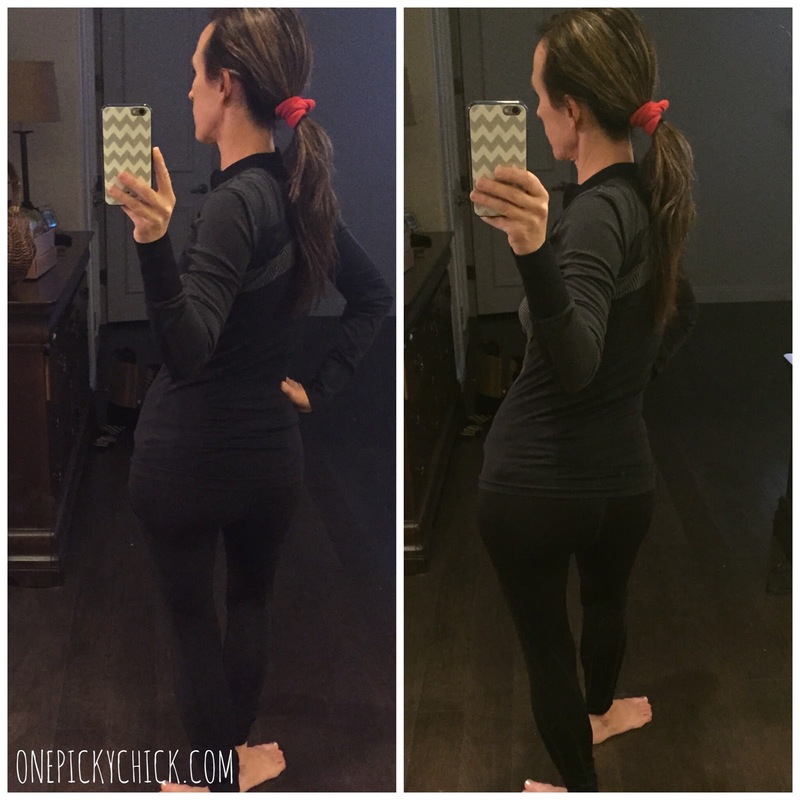 Now don't get me wrong, the Lululemon quality is far superior. I'm sure they'll last 5 years to my Forever 21's 1-2 years. But that's okay. It will give me a chance to buy new stuff, more often. Fore less money overall. Bottom line, I really like clothes but I think I'd rather spend my dollars on purses, shoes and dresses from Nordstrom. That's just me. and dropped another $140. Just this once. I didn't want to disappoint the fam and it WAS Christmas! In an answer to the question: Lululemon - is it worth it? I guess I'd say... you tell me?